A UVIC graduate, Shel Brodsgaard played professionally in the Canadian Soccer League, debuting in 1988 with the Edmonton Brickmen, later playing with the Victoria Vistas, Nova Scotia Clippers, North York Rockets and Winnipeg Fury. 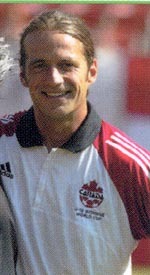 He also played for Hvidovre FC of the Danish first division and represented Canada internationally in Olympic qualifying matches in 1992. He has a level C National Coaching Program certificate, and has offered specialized training clinics through his company, Island Keeper Clinic. He was the goalkeeper coach for Canada's Women's World Cup soccer team and he was on staff with the Women's under-19 World Championship team when they won silver in Edmonton in 2002. He is the author of Soccer: Guarding the Goal (Bluefield, 2003), a guide to warm-ups and drills for coaches, which features anecdotes and tips from professional players. Co-written with North Vancouver journalist Bob Mackin, Goals and Dreams: A Celebration of Canadian Women's Soccer (Nightwood, 2005) highlights the Edmonton Under-19 Women's World Championships and the Women's World Cup, in which Canada beat Argentina, Japan and China to clinch fourth place. In 1973, there were only three girls' soccer clubs in British Columbia. By 1980, there 317 teams playing under the BC Girls Soccer Association. In 2004, there were more than 347,000 women and girls playing nationally on registered teams-42 percent of Canada's 825,000 players. With profiles of Canada's top female players such as Charmaine Hooper and Kara Lang, Goals and Dreams recalls and celebrates the evolution of Canadian women's soccer. You're the goalkeeper for Brazil. The game's tied. England has a penalty shot. Can you stop David Beckham from scoring? According to Shel Brodsgaard's Soccer: Guarding the Goal (Bluefield/Raincoast $24.95), you've got no choice but to guess 'n' leap. Conversely, if a goal is scored, the goalie must conceal his or her disappointment. The goalie must be supportive, dynamic and stable. "If a defender is not confident in a goalkeeper's ability,"; says veteran Canadian national team member Ian Bridge, "they will be anxious to stop or block all shots. This over-aggressive or over-eager attitude will enable a good attacking player to beat defenders. "; Some of the tips in Guarding the Goal apply equally well for goalies in other sports; but most are more specific to soccer. Bring a hand towel into the back of the net on rainy days to dry the palms of your gloves during breaks in the action. Featuring more than 100 photos and illustrations, Guarding the Goal is a step-by-step guide to warms-ups and drills for community coaches and beginner goalies aged 8 to 11 years; intermediate goalies aged 12 to 14; and advanced 'keepers' from 15 to 17. A 40-minute video is also available. Shel Brodsgaard, 32, grew up in Victoria where he operates Island Keeper Clinic. He recently mentored Erin McLeod who led Canada's FIFA Under-19 Women's squad to a silver medal at last year's world championship.